Cabinet held yet another meeting Tuesday to discuss a proposed US$50 million cruise port at Harvest Caye, and while a signal of government’s inclination was expected to proceed at that Cabinet meeting, all that we could glean from that session is that Government is prepared to give a provisional “yes” – which means that unless the investment can solidly meet five parameters Government said is now being applied to all investment proposals, they won’t get Cabinet support. The talks have not only been about Harvest Caye, though. Minister of Labour, Local Government, Rural Development, NEMO, and Immigration & Nationality Services, Godwin Hulse, has been appointed to head Cabinet’s Investment Subcommittee, and according to Hulse, they have been tasked to review two other projects: the Stake Bank proposal and the Puerto Azul proposal. The other committee members are Minister of Trade, Investment, Private Sector Development and Consumer Protection – Erwin Contreras; Minister of State in the Ministry of Finance and Economic Development – Santiago Castillo; Minister of Forestry, Fisheries and Sustainable Development – Lisel Alamilla; Minister of Tourism and Culture – Manuel Heredia, Jr., and the Minister of State in Hulse’s ministry – Elvin Penner. “We are at a stage with [Puerto Azul] where it is just a preliminary look. No details yet… Would Belize be interested in accommodating a project of this size? The response to that is, yes, provided all the parameters fit within Belize’s objectives. That is the key thing. We are trying to develop a win-win situation here. 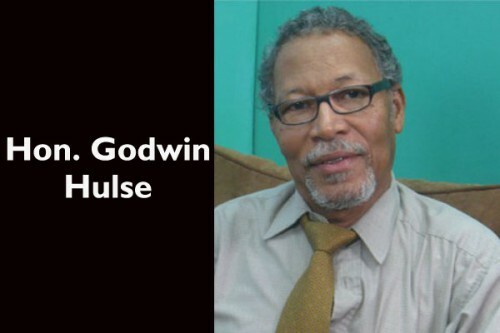 No longer will investors come here and Belizeans will feel exploited and the country gets nothing,” Hulse told us. As our newspaper has previously reported, the development proposal for Puerto Azul – an exclusive resort, with hotel, gulf, villas and spa, on Northern Two Caye (960 acres) and Sandbore Caye (10 acres), calls for accommodations for 1,000 guests and 2,000 employees. Proposed amenities include hotels, shopping centers, restaurants and bars, a golf club house, spa, airstrip and marina. The proposal also calls for an underwater lab. However, Roberto Pott, Belize Coordinator for Healthy Reefs for Healthy People, has told our newspaper that the project could seriously compromise a vital part of Belize’s reef ecosystem – vital because it is in the proximity of one of the last spawning grounds of the endangered Nassau Grouper, and one of the two cayes proposed for the development is an important mangrove island, which supports a nursery for Belize’s fisheries. The site is also near to the Blue Hole, which has been nominated to be tagged the 8th Wonder of the World. Down south, the controversy has been over whether the Government should allow mass tourism near the prime tourist destination of Placencia. Stakeholders in the overnight tourism sector there, as well as tour guides, have argued that the proposal by Norwegian Cruise Line should be rejected because it will spell trouble for stakeholders in the South. “One of the principal problems in the South, of course, is the concept of… ‘trample and trash.’ People are basically opposing a large volume of people moving in who will be destroying the sites and all this rest of thing; in other words, killing off the goose and killing off the golden egg. Of course, Government is not stupid. We are not prepared to do that,” Minister Hulse told us. For its part, Norwegian has told our newspaper that their motive for proposing the destination island for Norwegian passengers in Southern Belize is to improve visitor experience in Belize. Since 1998, Norwegian has been sending ships to Belize, and passengers have used the Belize City cruise port. “We think that if we can develop a destination that is Belizean, where the workers and the people that they meet are Belizean, and where the atmosphere and the vibe and the culture is Belizean, in a high quality, international standard destination, we think we will do much better – and introducing them to a part of the country – in a sensitive way – that is gorgeous!” Murphy told our newspaper. “The investors want to make money and that’s what an investor wants to do; we support that and understand that. But we don’t want him to come in and run ‘rough shod’ over us and repeat some of the things that have happened in the past where people see large investment but it doesn’t benefit Belize in any way,” Hulse told us today. The projects don’t yet have the green light, and even with a Cabinet approval, there would still be a need for the companies to fulfill other obligations, such as preparing an Environmental Impact Assessment and signing off on an Environmental Compliance Plan, before on-the-ground works can take effect. Cabinet met Tuesday, but instead of giving a signal of its approval or disapproval on the three projects in question, it tasked the subcommittee, headed by Hulse, to gather more information. Hulse said that the Government’s technical team will hold additional talks with the investors. Asked when the public can expect to hear something final on the proposals, Hulse indicated that the working committee should have finalized its work within the next 7 to 14 days, after which time, the matter goes back to Cabinet. The Minister reiterated the five areas of emphasis Government has mapped as a part of its assessment criteria: Firstly, the project has to be socially and economically acceptable, and legally doable; and secondly, there has to be revenue to the Government of Belize. “There is no point in having a lot of investment and the GDP is expanding but it doesn’t translate into revenue for the Government of Belize. Government of Belize has to make its revenue. If poor people and hardworking people are paying taxes, so also must investors. There are some concessions they’ll be asking for but we won’t give away the whole country,” Hulse commented. The third parameter he identified is that the project must also bring foreign exchange. Fourth, the minister said, the project must create some meaningful jobs. “And we don’t only mean the minimum-wage jobs; we mean jobs at all levels within the country, even as high as the manager down, if the particular project could utilize a Belizean who could fill that post,” he added.